This image is a collaboration with Lucy, who is a great illustrator herself – the idea was to aim for an image which would convey a bit about the person as well as her work. 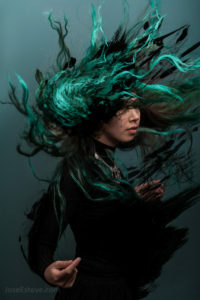 We started from a photograph of her, trying to get some shapes and motion on her green hair (this was quite fun to shoot, but impossible to direct!) and then Lucy further enhanced the image by incorporating brush strokes of acrylic paint, scanned and blended with the digital image.